I have written about the problems with dual axis graphs in the past. One situation where some presenters say dual axis graphs are necessary is when the two data series being compared are measured in very different units. In this case, they say that you need a dual axis graph because the measurement units aren’t the same. I dealt with this situation recently in one of my customized workshops and I think there is a better alternative to a dual axis graph, even if the measurement units are different. A dual axis graph can still be a problem because the two axes can be manipulated to tell very different stories. 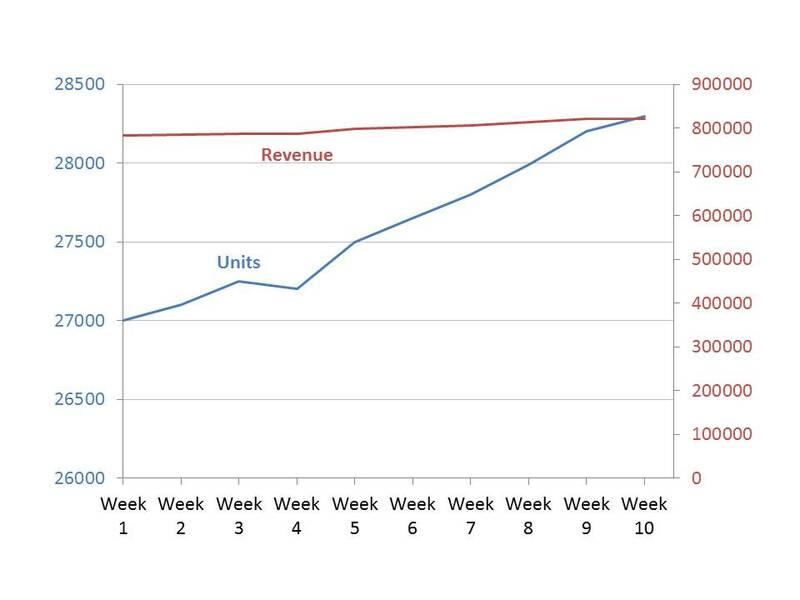 Now it looks like the revenue has not been growing much as units sold have increased dramatically. This is not necessarily the case. You have to do a lot of analysis as an audience member to figure out the true story. A better visual to use when the two data series are measured in different units is a multiple index line graph. Indexing is a concept from economics and it allows trends in multiple data series to be easily compared. Indexing sets the initial value of each data series to 100, and then calculates the other index values in the data series based on the difference of each data value to the initial value. 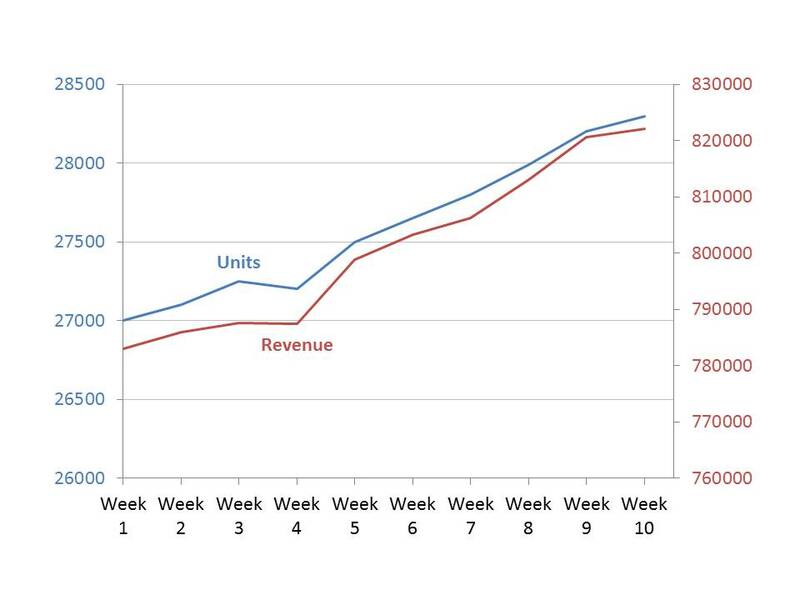 Now we see that the revenue did not grow as fast as units in the first four weeks, but has grown faster than units since then. Because we are now comparing the two series on the same measurement basis, the comparison is valid and cannot be manipulated. 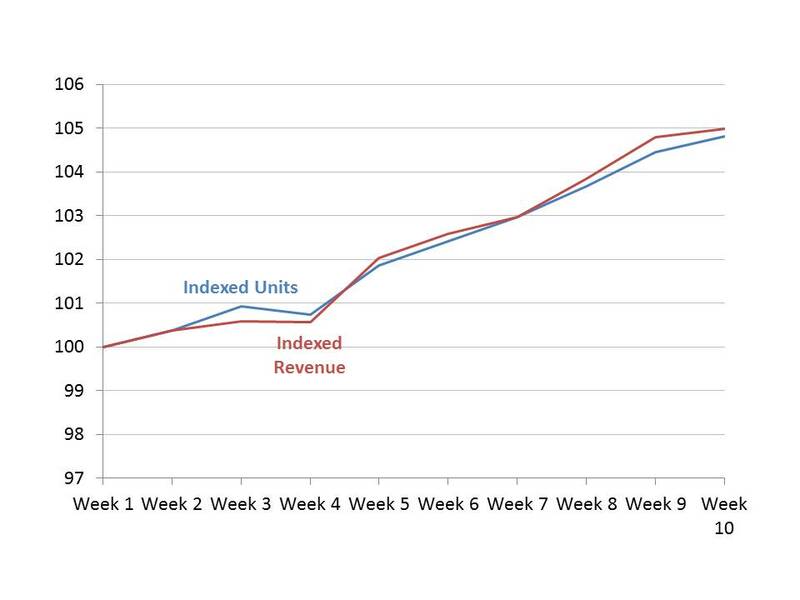 I have found this multiple index line graph a good visual to tell the true story when communicating a message about growth in two data series that are measured using different units. Consider this type of visual the next time you have to present this type of message.